Partly sunny, with a high near 62. Windy, with an east wind 8 to 13 mph becoming north 20 to 25 mph in the morning. 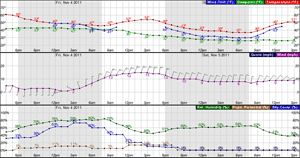 Winds could gust as high as 38 mph. Partly cloudy, with a low around 38. Breezy, with a north wind 13 to 18 mph becoming light and variable. Winds could gust as high as 28 mph. Sunny, with a high near 75. South southwest wind around 6 mph becoming calm. Mostly clear, with a low around 44. Southeast wind around 7 mph becoming southwest after midnight. Mostly sunny, with a high near 80. Southwest wind 3 to 6 mph.